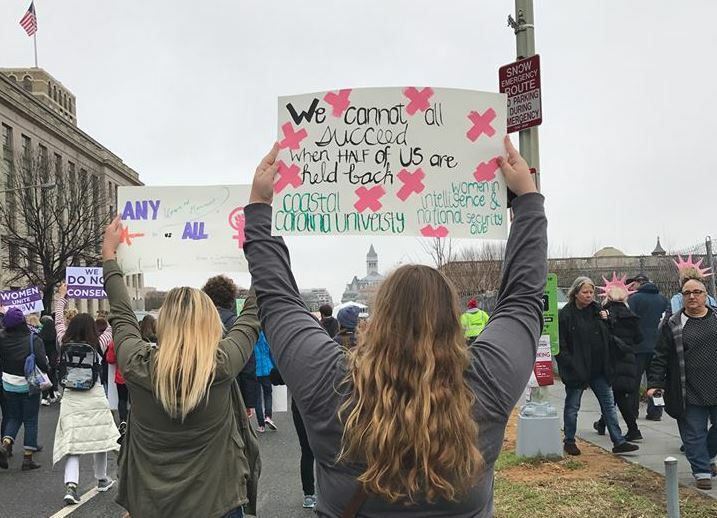 Since its founding in October 2016, Women in Intelligence and National Security has participated in, organized or co-organized countless events, including trips to government agencies and guest lectures by experts. 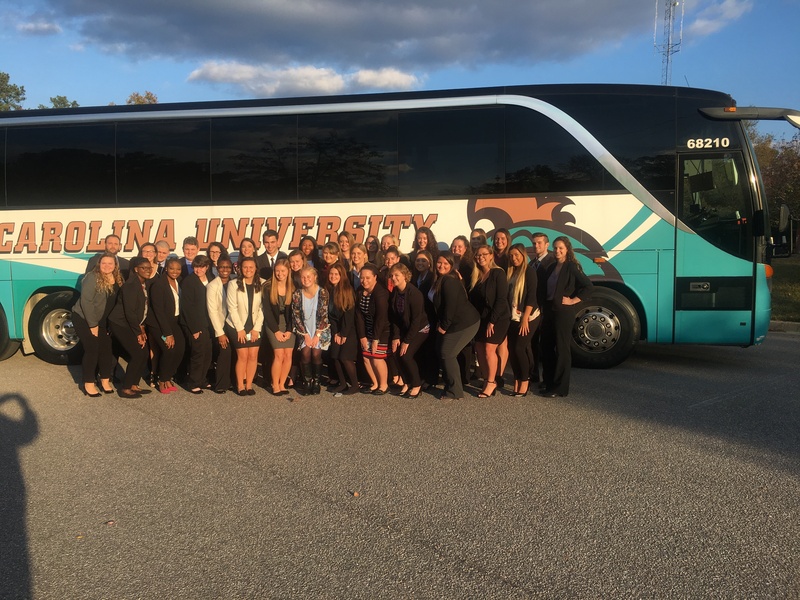 It also organized and hosted the 2nd Intelligence and National Security Conference, a two-day event at Coastal Carolina University, which drew over 20 nationally renowned speakers from agencies including CIA, NSA, FBI, DEA and others, and more than 200 attendees. In 2019, WINS organized a day-long Professional Development Workshop with the participation of –among others– representatives from the NSA and the Department of State. WINS has been featured several times on television and print media. A list of our accomplishments is provided below, in reverse chronological order (from newest to oldest). February 4, 2019 – WINS organizes a day-long Professional Development Workshop for Careers in Intelligence and National Security at the Sheraton Myrtle Beach Hotel and Convention Center. The workshop includes presentations by representatives from the NSA, Department of State, FBI, DEA, and others. Click here for more information about the workshop. January 15, 2019 – WINS participates in the spring 2019 Organization Kick-Off Day with a display that includes banners with the club’s logo. Many students sign up and are emailed to attend the club’s first meeting of the semester on January 23, 2019. December 6, 2018 – WINS holds its culminating Women Undercover event, with the participation of former former FBI Special Agent Dana Ridenour. The meeting was open to WINS members only. 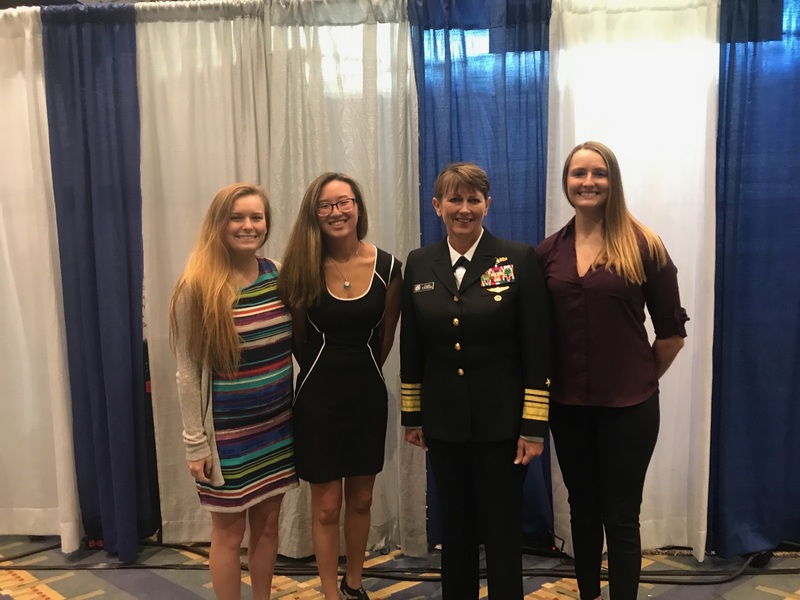 November 14, 2018 – WINS hosts a speaker from the Drug Enforcement Administration, who discussed her work, accomplishments and professional challenges, and gave career advice to WINS members. November 7, 2018 – WINS holds its general-membership meeting on the topic of study-abroad and foreign travel for women travelers. Students who have participated in such programs shared their experiences and provided advice. 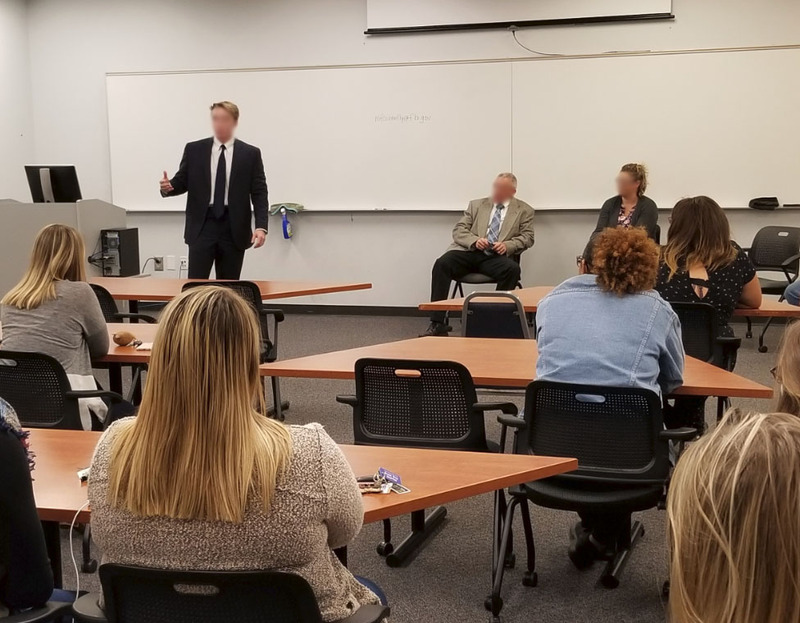 October 24, 2018 – WINS hosts four speakers from the Federal Bureau of Investigation. The speaker, a Special Agent, an Analyst, a Support Technician and a Student Intern, discussed their work and professional challenges. August 20, 2018 – WINS participates in the fall 2018 Organization Kick-Off Day with a brand new display that includes banners with the club’s logo. Over 60 students sign up and are emailed to attend the club’s first meeting of the semester on September 5, 2018. 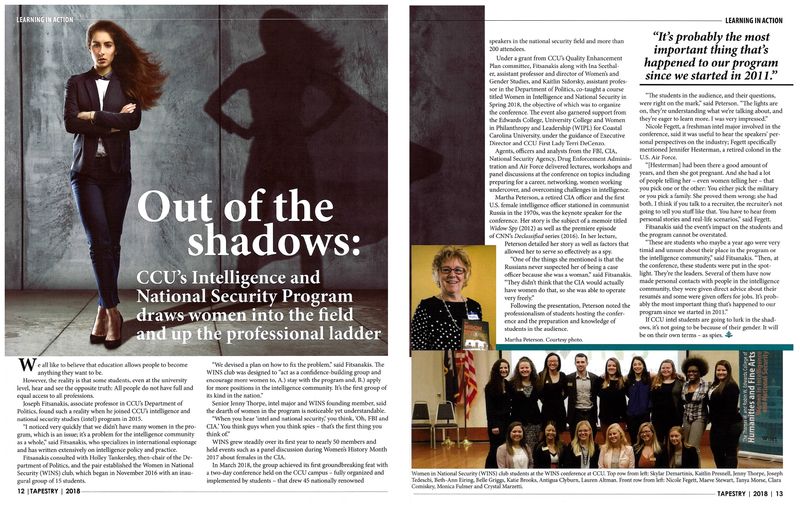 July 2018 – The 2018 issue of Tapestry, the official magazine of the Thomas W. and Robin W. Edwards College of Humanities and Fine Arts at CCU, devotes one of its leading articles to WINS and its role in organizing and hosting the 2nd annual Intelligence and National Security Conference at CCU. March 17-18, 2018 – After two months of painstaking preparation, WINS organizes and hosts the 2nd Intelligence and National Security Conference, on the themes of careers and women in intelligence and national security. The two-day event at CCU draws over 20 nationally renowned speakers and more than 200 attendees. The conference opens with a riveting keynote speech delivered by Martha “Marti” Peterson, a career officer of the Central Intelligence Agency (CIA). The conference received much media attention, including coverage from WBTW News Channel 13 (CBS). For more about the conference, see here. 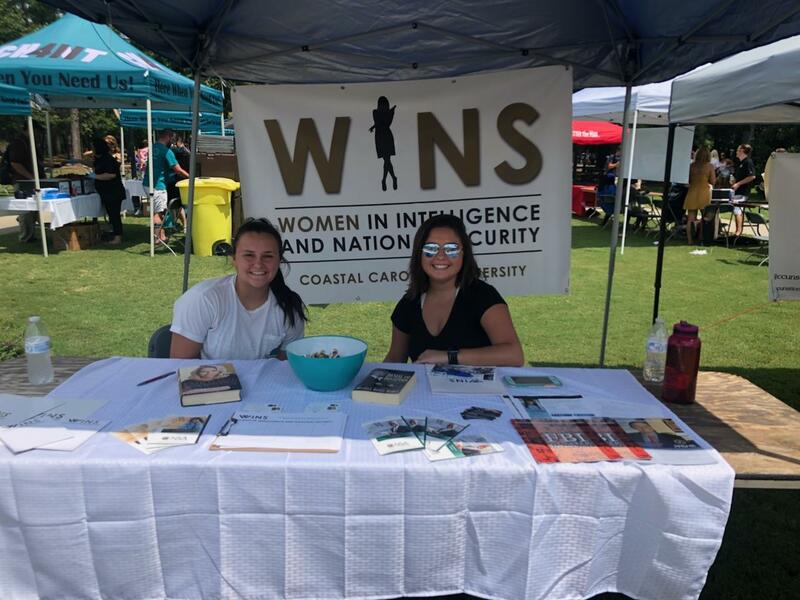 January 15, 2018 – The first WINS undergraduate class launches as an interdisciplinary collaborative project between the Intelligence and National Security Studies, Political Science, and Women’s and Gender Studies at CCU. Sixteen students register in the class, the first of its kind in the United States. February 24, 2018 – An Interdisciplinary Experiential Learning Project grant proposal by WINS faculty mentor Dr. Joseph Fitsanakis, Dr. Kaitlyn Sidorsky (Politics) and Dr. Ina Seethaler (Women’s and Gender Studies) is successful. 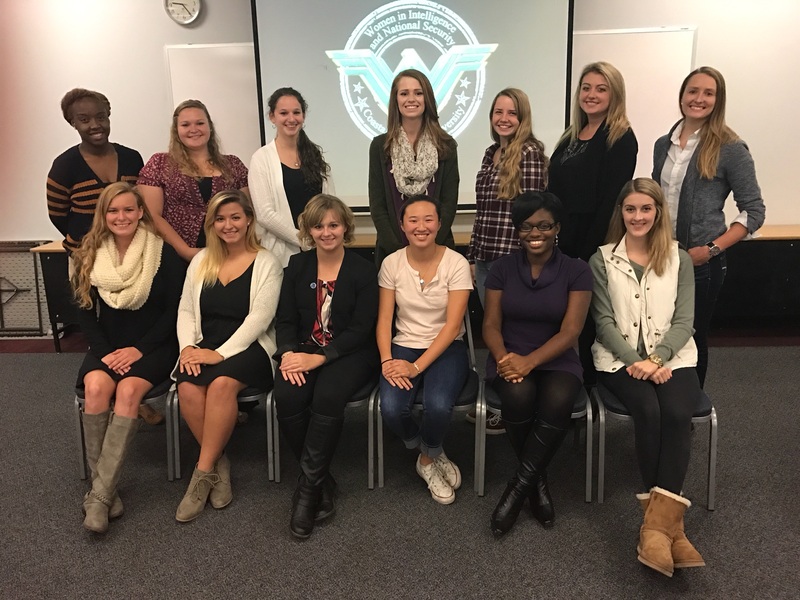 They secure up to $10,000 from CCU’s Quality Enhancement Project to teach a class called Women in Intelligence and National Security. 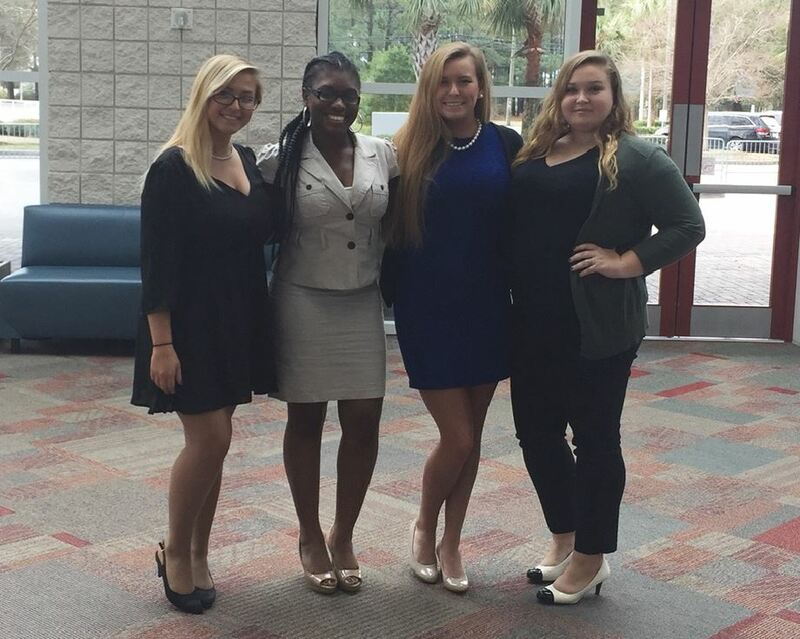 As part of the class, WINS will help organize and host the 2nd Intelligence and National Security Conference at CCU. January and February 2018 – Following on its “Pressing Issues” workshop series, WINS hosts a four-part discussion series on the topics of stress and anxiety, confidence in the classroom, and sexual assault. Over 120 students participate in the discussion series. November 14, 2017 – Over 40 WINS members are hosted at the Federal Bureau of Investigation’s Columbia, SC, field office, for a three-hour presentation and workshop on professional résumés for the intelligence and law enforcement communities. The day-long trip is generously sponsored by the Department of Politics at CCU. 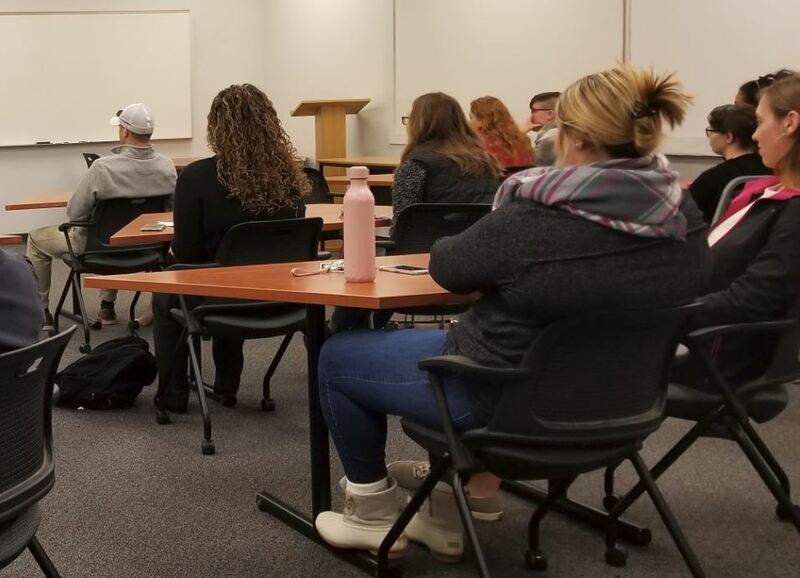 October and November 2017 – Over 150 CCU students participate in a series of four workshops organized and hosted by WINS. Entitled “Pressing Issues”, the workshops aim to identify and address the major issues of concern to both male and female students. Topics discussed include confidence in the classroom, stress and anxiety, sexual discrimination and assault/harassment. 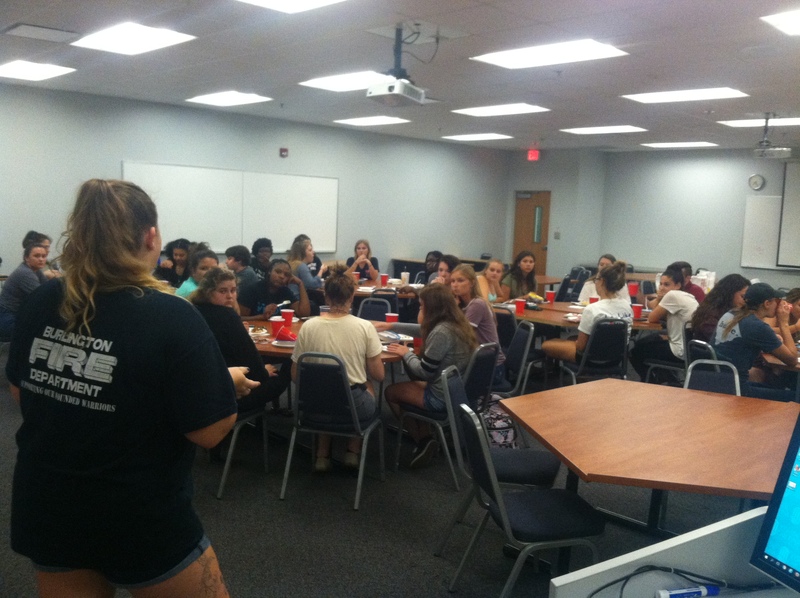 September 27, 2017 – WINS launches its “Pressing Issues” weekly workshop series with a potluck that is attended by over 40 students and faculty at CCU. September 6-7, 2017 – A four-member delegation represents WINS at the Intelligence and National Security Summit, held by the Armed Forces Communications and Electronics Association at the Walter E. Washington Convention Center in Washington, DC. 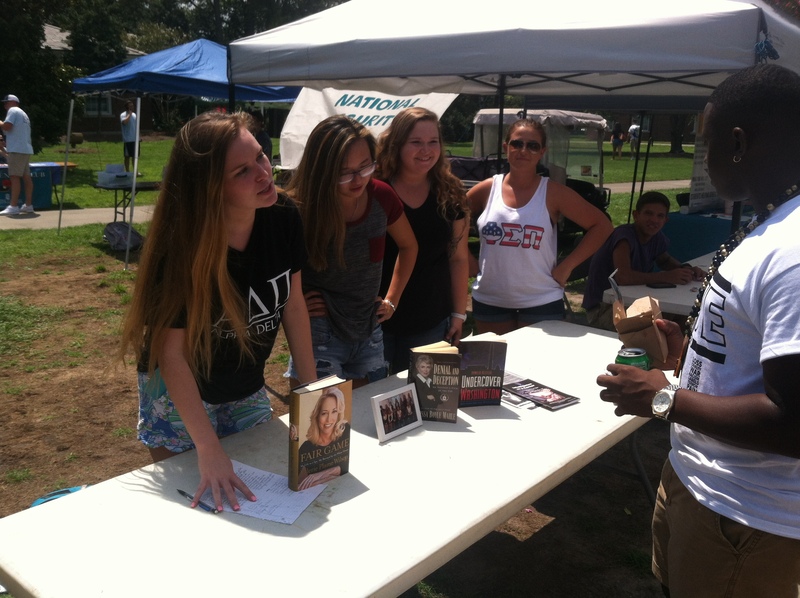 August 23, 2017 – WINS participates in its first ever Organization Kick-Off day, where CCU student clubs staff informational tables on Prince Lawn in order to attract, inform and register new members. 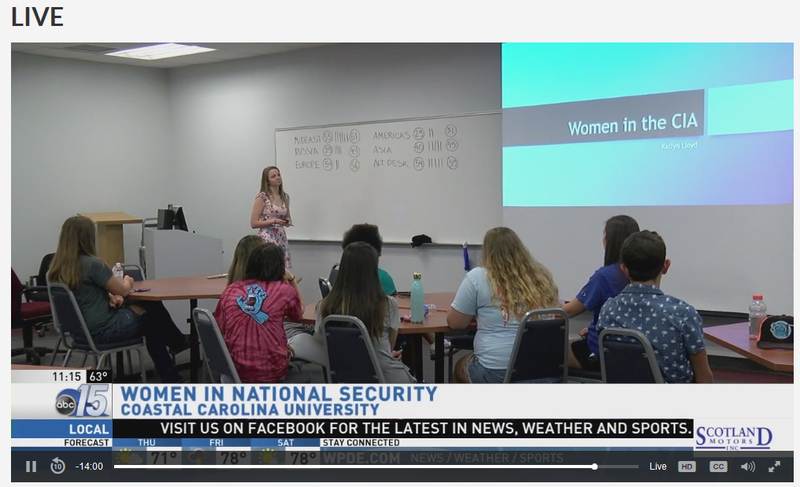 March 29, 2017 – WINS participates in Women’s History Month events at CCU by hosting a talk by WINS freshman ambassador Katlyn Lloyd on the role of women in the Central Intelligence Agency, historically and today. The WINS talk is covered locally by WPDE Channel 15 (ABC). March 2017 – WINS has the honor of hosting three distinguished professors at its general membership meetings: Dr. Frederick Wood, Chair of CCU’s Deparment of Politics; Dr. Aneilya Barnes, Associate Professor of History, and Brigadier General D. Marie Goff (Ret. ), the first female general officer of the South Carolina National Guard. 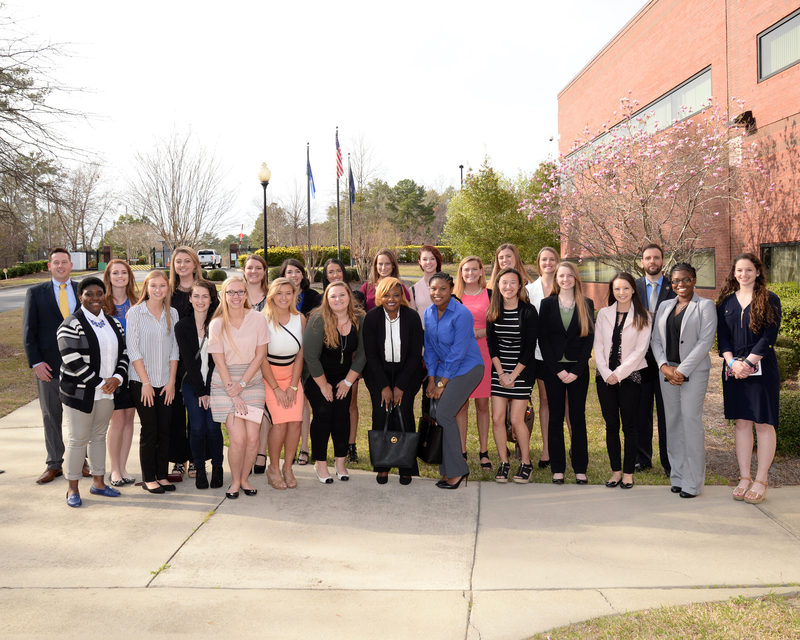 February 27, 2017 – The Federal Bureau of Investigation (FBI) hosts more than 30 WINS members at its Columbia, SC, field office for a four-hour career-advice workshop, led by women leaders at the FBI. February 17, 2017 – WINS participates with a four-member delegation at the seventh annual Women’s Leadership Conference, organized by Women in Philanthropy and Leadership in Myrtle Beach, South Carolina. January and February 2017 – WINS has the honor of hosting three distinguished professors at its general membership meetings: Dr. Holley Tankersley, Associate Professor of Politics and Associate Dean; Dr. Ina Seethaler, Assistant Professor and Director of CCU’s Women’s and Gender Studies program; and Dr. Kaitlin Sidorsky, Assistant Professor of Politics at CCU. January 21, 2017 – WINS participates in the historic Women’s March on Washington, DC, by sending a three-member delegation. Our effort attracts regional attention is featured on WPDE Channel 15 (ABC) and CCU’s Atheneum magazine. January 18, 2017 – WINS holds its inaugural general-membership meeting at CCU’s Coastal Science Center, with the participation of over 50 students and faculty. The first official members join the new organization. January 17, 2017 – WINS organizes its first official excursion, a club trip to the motion picture Hidden Figures, a biographical drama about black female mathematicians who worked at the National Aeronautics and Space Administration (NASA) during the Space Race between the United States and the Soviet Union. January 11, 2017 – During a two-hour meeting, WINS executives finalize the first official club constitution, and mission statement. An application is filed with CCU’s Student Government Association to recognize WINS as an official organization at the university. November 9, 2016 – The club is officially founded under the name Women in Intelligence and National Security (WINS). The club’s founding members are, in alphabetical order: Katie Brooks, Antigua Clyburn, Rachel Drummond, Monica Fulmer, Lindsey Hamiton, Victoria James, Katlyn Lloyd, Casey Mallon, Madison Nowlin, Allison Reilly, Eia Richardson, Brooke Stotler, Jennifer Thorpe. 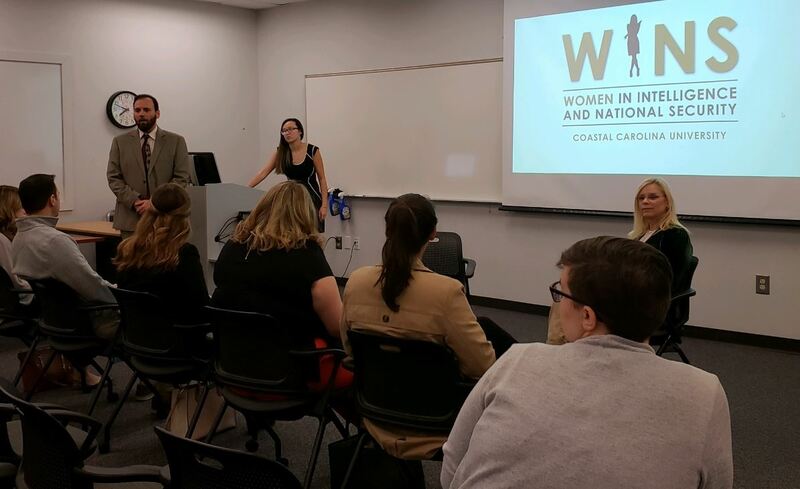 October 20, 2016 – The first WINS general-interest meeting takes place in CCU’s Coastal Science Center, attended by approximately 20 students who are interested in helping spearhead the new project. 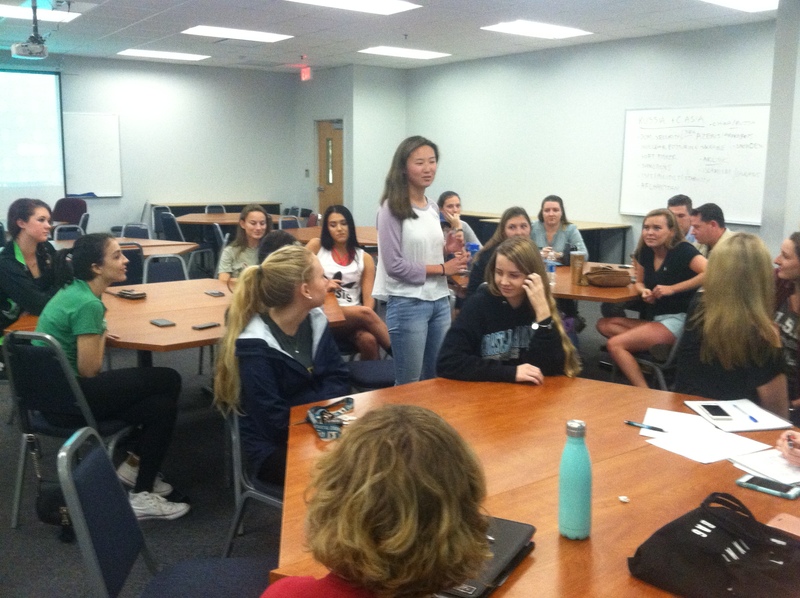 September and October 2016 – A series of focus group meetings are organized, where INSS students share views and ideas about what a WINS-type effort would look like at CCU. Approximately 30 students participate in these meetings, with about 15 –ranging from freshmen to seniors– offering to step forward and help lead the new effort. 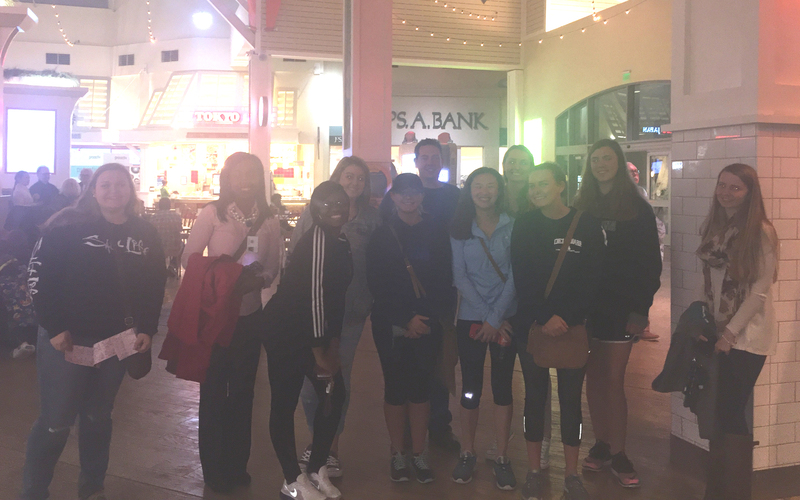 April 2015 – A group of women students help Dr. Joseph Fitsanakis design a two-page survey that is given to students in the INSS program at CCU, to see whether there is an interest in helping set up a WINS-type group. Over 80% of respondents enthusiastically support the effort and many say they are willing to help lead it.